← Crash Course: Wind turbine bird, bat deaths to be monitored? Where you find there DNA you may not find Asian Carp. Photo: US Fish & Wildlife Service. Federal scientists studying the origins of Asian carp DNA found in the Great Lakes, particularly in the Chicago Area Waterway system, ground zero in the politically heated debate about separating Lake Michigan from the Mississippi River Basin, have learned the genetic material can arrive by bird, barge, sewer or other means. Finding DNA today may not mean the dreaded fish are swimming somewhere near. Those and other findings were announced two weeks ago by the Army Corps of Engineers, the US Fish and Wildlife Service and US Geological Survey in an interim report about a three-year study underway that was funded by the Great Lakes Restoration Initiative. The $6.15 million study found storm sewers carrying melted ice water from fish markets where carp are sold, fish eating birds leaving droppings behind, fish sampling gear and dead carcasses or slime on barges all can deliver Asian carp DNA to a waterway. Those findings are significant, according to Kurt Schilling, the fisheries program manager for the USFWS Midwest office in Minneapolis MN. They illuminate various ways Asian carp eDNA can be moved from place to place. “When eDNA emerged as a viable tool for detection and we started getting positives it was like now what does that mean,” Schilling said. “We got out with boats and gear and didn’t find any fish. As the study goes forward the work effort will shift. The FWS will take over sampling and processing of the DNA samples at a new genetics laboratory in La Crosse , Wisconsin instead the Army Corps of Engineers lab in Mississippi. The Army Corps will work to further calibrate the computer model being used to identify the DNA. The agency has requested another $1.3 million for the work. Scientists will someday be able to determine the probability of DNA coming from a live Asian carp, according to Baerwaldt. 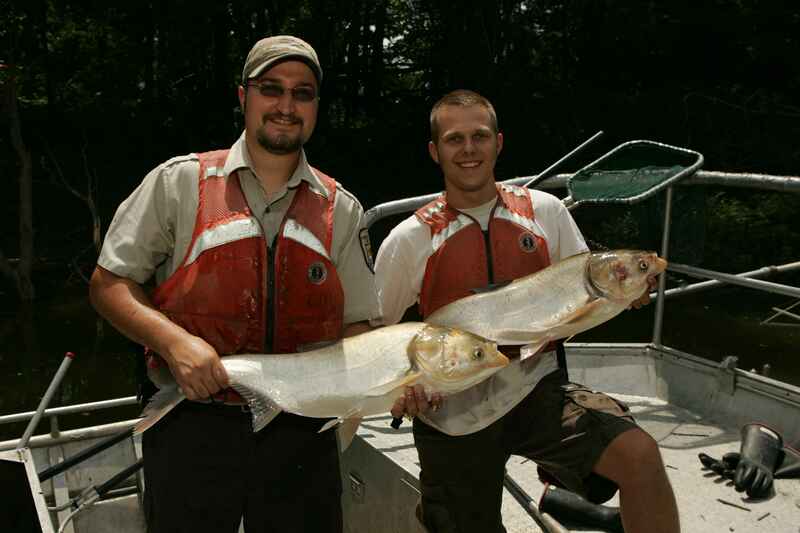 Upcoming research will identify and catalogue how Asian carp DNA degrades with time and different types of exposure. The current study began in an effort to answer questions that arose after the DNA was found, but large-scale efforts to find live carp came up empty-handed. “We did a large-scale rotenone kill on six miles of water and fished the snot out places and still didn’t get any fish. We kept looking the (DNA) test results and didn’t have any good answers. That’s where this (eDNA) calibration study was born,” Baerwaldt said. Schilling said his agency will now take the lead on Asian Carp DNA sampling and processing. “It’s a better fit,” said Schilling. “Our mission is to preserve protect and enhance fish and wildlife,” he said. “One of the goals of GLRI is to have an early detection system in place. This is one of the first steps. We will be looking at tributaries around the Great Lakes. The Chicago Area Waterway will be priority one for us. The Great Lakes is the next priority and then come other hotspots like the Upper Mississippi and Ohio Rivers. Baerwaldt said she doubts that any Asian carp got past the electric barrier on Chicago Area Waterway. And basin separation may prove more of a political question than scientific at this point. This entry was posted in Uncategorized and tagged Asian Carp, Chicago Area Waterway System, DNA, Environment, Great Lakes, Lake Michigan, Mississippi River, Ohio River, U.S. Army Corps of Engineers, U.S. Fish & Wildlife Service. Bookmark the permalink. I just hope some politician doesn’t use this to further his/her cause of everything is fine, nothing to worry about, no problem here, excuse me while I put my blinders back on. mfs686, Point taken. It will be a easy bet to make money on that the USACE and our snail pace government actions will stall the permanent fixes long enough to see the Asian carp in the Great Lakes. Mr. Reef is correct. Sorry, Mr. Meyerson. What these scientists are studying and finding, frankly is a relief. The decision to split the basins is huge. Not one to be taken lightly. These findings shed light on alternate sources for carp DNA and likely the real sources. I’m glad to see them doing this work and hope they continue to find funding for it. Everything in Howard’s statement is correct and I agree with him. I’m glad they are doing the work too and that progress is being made. I just have no faith in politicians to do the right thing. mfs686: I agree with you fully w regard to politicians, which is why its good the science is coming out. Not that today’s pols care about science.Which gets back to your point.